Amongst the many revelations at VMworld this year were the renaming of VMware’s hosted cloud service product to vCloud Air and the announcement of their new converged infrastructure appliance, EVO:RAIL. A year ago, VMware announced its widely anticipated cloud service with the moniker: vCloud Hybrid Service. This, of course, produced a fair amount of vConfusion as the service was a public cloud (or dedicated private cloud), IaaS offering. While VMware’s intent was that the service be used in a hybrid fashion by connecting an existing, VMware-based, customer owned, private cloud to the vCloud Hybrid Service, the implication was that the cloud service was itself hybrid capable. The cumbersome name was most commonly referred to by its acronym vCHS (or was it vHCS?). What happens when your community has difficulty with branding? They inevitably go their own way. Thus, people in the trenches eventually developed vCHeeSe as a replacement name/mnemonic, much to VMware’s chagrin. Kudos to the VMware product name squad for coming up with vCloud Air (not to be confused with Apple’s iPad Air, Adobe AIR, Nike’s Air, or 90% of the Airline companies) to be used moving forward. The other big announcement at VMworld 2014 was an exciting new ‘datacenter-in-a-box’ product. 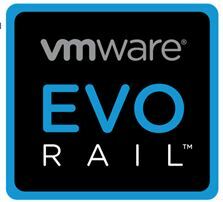 VMware also released the name of this partner-supplied hardware implementation: EVO:RAIL. There is a great story behind the name, something to do with EVOlution and server rails. Our guess, next year we’ll be hearing about a new name for the hyper-converged infrastructure appliance: vCloud Box.